We have today installed a new type of system for safe movement of school pupils between split sites. Students attending Litcham High school in Norfolk have to cross a road to access their playing field. 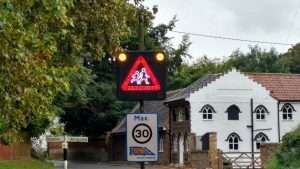 As there was no existing crossing facility at this location, we have designed, manufactured and installed a system utilising a combined Vehicle Activated 30 MPH roundel which is superimposed with a Children Crossing warning triangle (TSRGD 545). 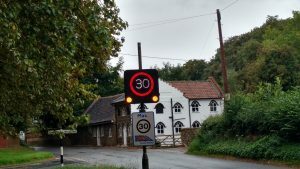 The default operation is the Speed Sign. 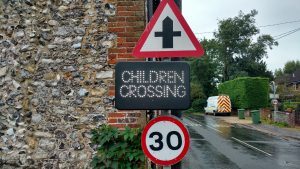 However, when required, the escorting member of staff can remotely operate the warning triangle, overriding the speed sign and also simultaneously bringing the Children Crossing legend sign into action on the other side of the crossing area. Built in tell-tale LEDs are installed to confirm that the system is functioning correctly. The crossing signs are pre-set for the appropriate operation time once activated, this is agreed according to the site requirements. The sign will then revert to speed activation after this time has expired.